For generations, farm labor has typically been mostly performed by farm families. As NDA farms have grown, though, more farm laborers are now working on NDA farms with the family members. Along with this growth in outside labor has come an increasing interest and commitment from NDA members toward developing and supporting ever more effective labor management practices on their farms. Starting several years ago and continuing with greater intensity beginning in 2014, NDA has been providing its members with a range of human resource management support services. For example, NDA conducts hundreds of farm employee anonymous interviews every year through professional third-party companies in the absence of the farmers to identify baseline conditions and opportunities to deploy best practices for improvement. 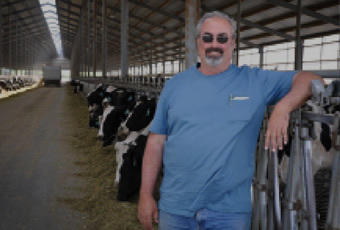 These in-depth reviews give Darigold customers a chance to see for themselves the labor management practices our dairy farmers have in place. They also allow our producer-owners both to be exposed to the newest leading-edge thinking about labor practices and to shore up areas where they want to improve (e.g., written documentation of their existing practices). NDA has also taken “best-practice” labor evaluations from other industries, and, working with expert labor specialists, developed a dairy-specific labor evaluation. We have been conducting labor evaluations on a portion of NDA farms each year since 2015. Beyond these formal third-party labor evaluations, though, NDA has also developed a dairy farm labor self-assessment survey tool. This has proven to be a significant benefit for NDA members, as many of them, like so many small businesses, have not developed formal written policies or documented standard operating procedures. The self-assessment tool is providing a mechanism for them to check themselves against comprehensive lists and to document and standardize the human resource processes and procedures they have often been practicing informally. In addition to these formal labor practices evaluations and the labor relations self-assessment tool, NDA has also been holding training seminars about labor management throughout the Northwest. NDA has held seminars in Washington, Oregon and Idaho where best practices in human resource management for dairy operations were outlined and reviewed. 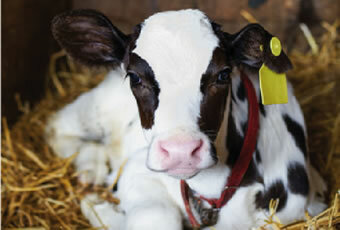 In addition, NDA has been sponsoring labor management trainings at various dairy conferences throughout the region. Dairy farms are 24-7-365 operations – and as such they provide opportunities for year-round employment for many farm workers. NDA is committed to supporting its members in their goal of pursuing excellent labor management practices and operating under a culture of continuous improvement. Having satisfied, committed employees is good for business, of course, but for producer-owners at NDA, treating employees right is a central component of their view of what cooperative social responsibility is all about. 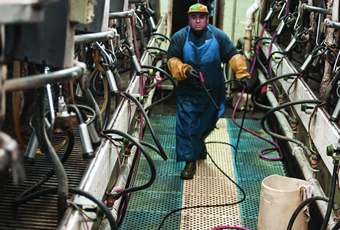 NDA member farms are deeply committed to protecting the safety of their dairy employees. For the farmer-owners, this is about values first and secondarily a business practice. The Washington State Department of Labor & Industries workers comp premium base rates are a commonly used proxy for injury risk. The dairy industry, which is a live animal farming industry, rates favorably against other similar and directly comparable live animal farming industries, having an L&I premium base rate of $1.28. This is better than the L&I rate of $2.16 for livestock (cattle and hogs) or $1.38 for eggs and poultry. The NDA farmer-owners want all employees to go home in the same or better condition than when they arrive at work. Through strong deployment of the Standards & Guiding Principles adopted by the farmer-owners, they hold themselves accountable to a system of expectations and industry best practices, professional third-party on-site inspections and verified evaluations, and training, tools and cycles of continuous improvement processes to be even better in the future. Across the Northwest, NDA dairy farmers are pillars of their communities. Look to any rural need and you’ll find dairy farmers shouldering huge shares of the efforts to meet them. In addition to environmental responsibilities and concern for their labor force, NDA farmers also hold as a high commitment an abiding conviction to support the social fabric of their local towns and communities. NDA farmers are serving as team coaches, mentoring young farmers, leading church committees, guiding local school boards, and pitching in to help neighbors struggling with hard times. Rarely do these dairy farmers look toward or receive much public recognition, but the social health of these communities is vitally dependent on their widespread support and steadfast voluntary contributions.